The premier drug guide for nurses and midwives since 1983. 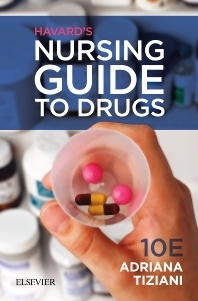 Now in its 10th edition, Havard's Nursing Guide to Drugs continues to provide reliable, accurate drug information for nursing and midwifery students and practitioners. This user-friendly drug guide delivers safe, up-to-date drug administration information regarding form, action, use, dose, adverse effects and interactions in compliance with current pharmaceutical guidelines from the Therapeutic Goods Administration and MIMS. Nursing points and cautions highlight best practice in drug administration and expanded focus on Patient teaching and advice ensures quality patient care.